Baking Bacon in the oven is an easy method for cooking perfect bacon, the best part is, no mess! Enjoy the bacon immediately or save for other recipes! 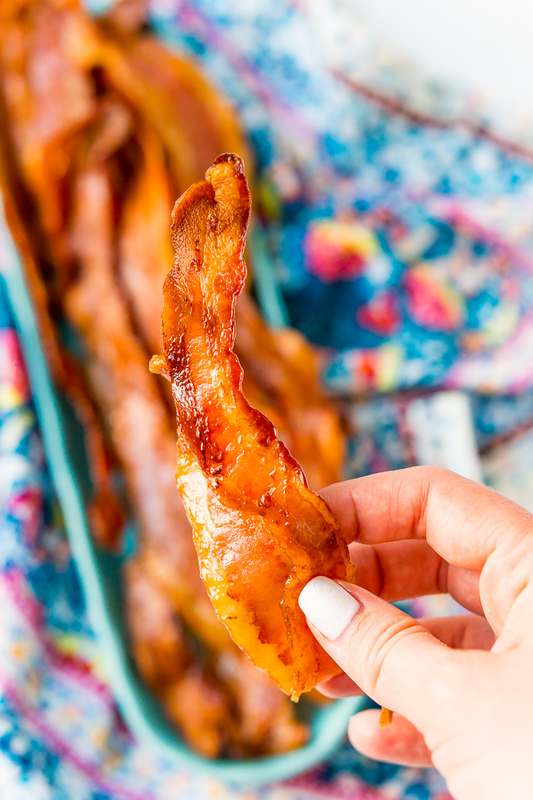 Those of us who love bacon can’t get enough, and if you make it for yourself or your family a couple times a week, this hack for Baking Bacon will be a total game-changer! If you’ve always cooked bacon in the frying pan, I’m here to say, you’ve been doing it the hard way all these years. When it gets too hot, it smokes and splatters hot oil, and that’s a good way to burn yourself! JUST TAKE ME TO THE BAKING BACON RECIPE ALREADY! 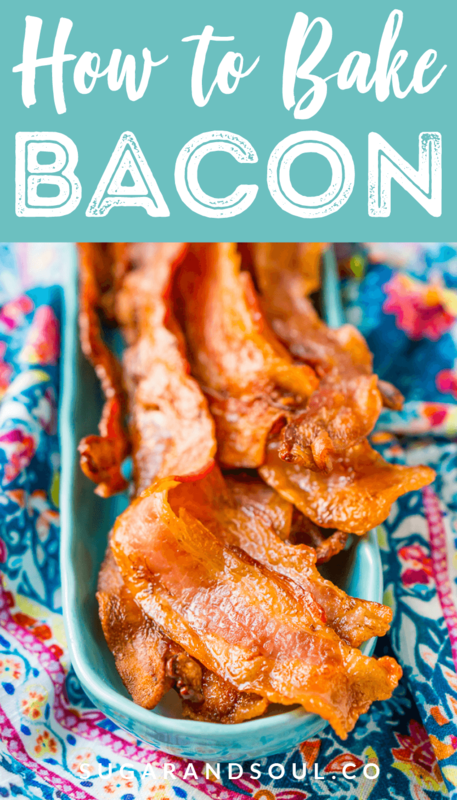 If you’d rather skip my (very helpful, I think) tips and tricks, essential cooking info, and similar recipe ideas – and get straight to this deliciously easy Best Ever BAKED BACON Recipe – simply scroll to the bottom of the page where you can find the printable recipe card. Even if you pop your bacon in the oven, clean up is a pain. You’re still left with a puddle of grease and you have to deal with disposing of it since it can’t go down the sink. So, here’s how to cook bacon easily, safely, and without making a huge mess! Start with a pound of thick-cut bacon, and preheat the oven to 415 degrees F. Next, line a large rimmed baking sheet with aluminum foil, and place a cooling rack on top. Place the strips of bacon on the cooling rack (they can be touching since they shrink, but don’t let them overlap). As they cook, the grease will drip down onto the aluminum-lined baking sheet. 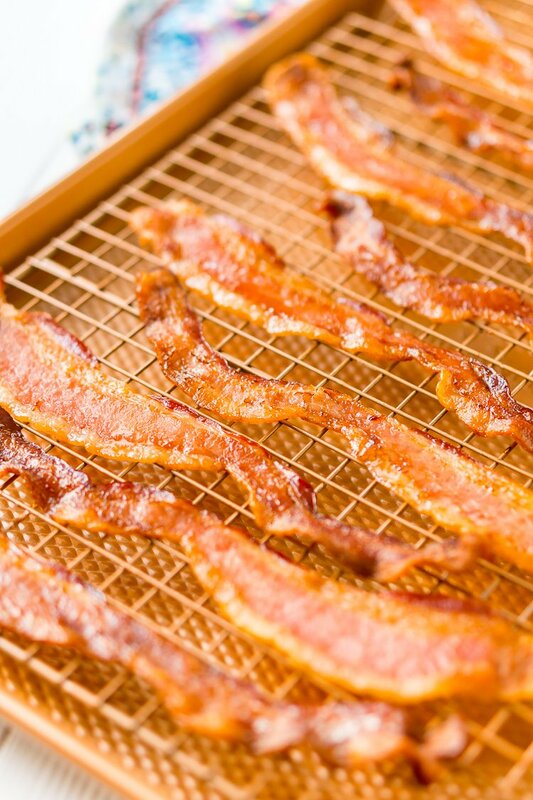 Your Baked Bacon should be ready in 20 to 22 minutes, depending on thickness. It’s a good idea to check it a couple times to make sure it gets cooked how you like it, although the aroma might let you know when it’s almost done! When you remove the pan from the oven, be very careful since it will have bacon droppings in it and you don’t want to burn yourself. After cooking, transfer the strips onto a paper towel-lined plate to soak up the excess oil. And now for the best part: once the grease on the aluminum foil is completely cooled (you’ll know once it’s solid), all you have to do is crumble it up and toss it out! 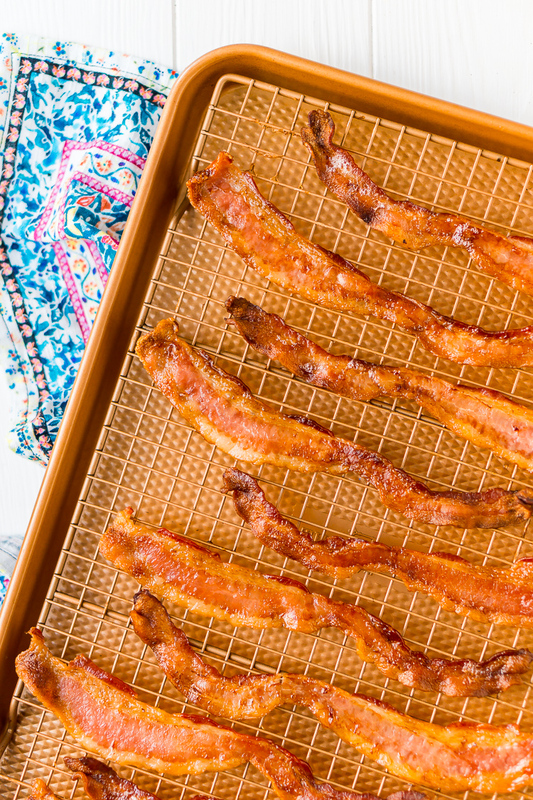 Here’s a tip for those who like softer bacon: skip the cooling rack altogether and place the strips right on the aluminum foil. They’ll come out more tender and less crispy. 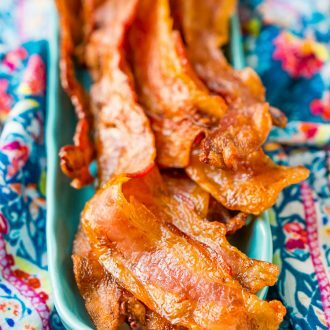 Next time you make bacon for breakfast or your favorite recipe, try this quick and easy Oven Baked Bacon method! Trust me, it’s way better than using a frying pan. 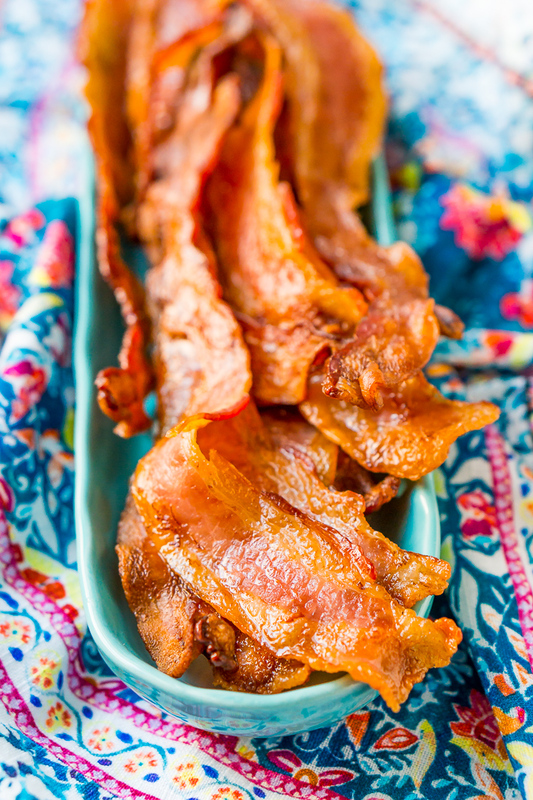 Pin this Baking Bacon Recipe for Later! I created a fun little group on facebook and I’d love for you to join in! It’s a place where you can share YOUR favorite recipes, ask questions, and see what’s new with Sugar & Soul (so that you never miss a new recipe)! If you’d like to check it out, you can request to join HERE. Be sure to follow me on Instagram and tag #sugarandsoulco so I can see all the wonderful recipes YOU make from this site! You can also Subscribe to my Newsletter so you never miss a delicious recipe again! Preheat the oven to 415 degrees F and line a large rimmed baking sheet with aluminum foil, and place a cooling rack on top. Place the strips of bacon on the cooling rack (they can be touching since they shrink, but don’t let them overlap). As they cook, the grease will drip down onto the aluminum-lined baking sheet. When you remove the pan from the oven, be very careful since it will have bacon droppings in it and you don't want to burn yourself. Bake the bacon for 20 to 22 minutes, depending on thickness. It’s a good idea to check it a couple times to make sure it gets cooked how you like it. Cook longer for crispy bacon. Nutrition Facts are an estimate based on 1 lb of bacon.